We grewd dees fings | ak.moves.south. We’ve eaten all the veg now :0( It was luuuurvely. 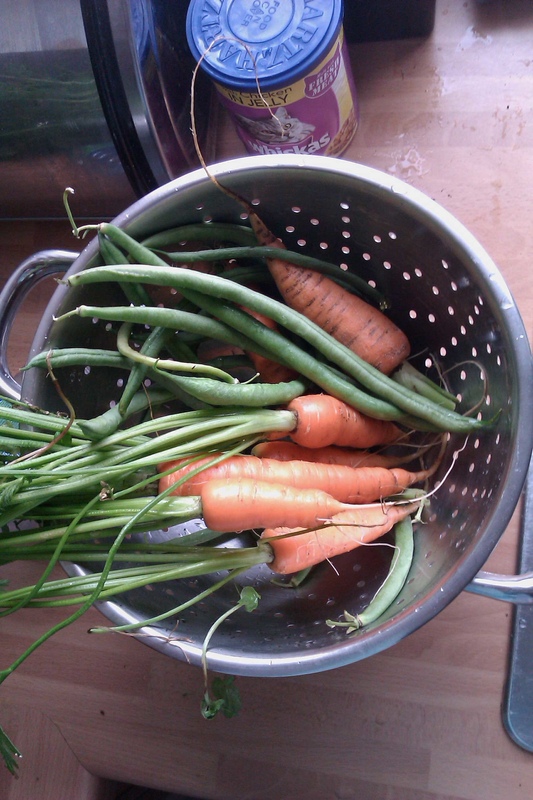 All the carrots, lettuce and french beans have been munched. Me thinks it may have to be spuds, carrots and some grapes next. I also have some news on the job front. I have an interview lined up for next Tuesday so fingers, toes etc. crossed for that – back in to the corporate world. Oh how I have enjoyed my time with the kids as a full time beach bum but now Ems is starting school I need to start earning my keep :0(. Games, free games, yea! One of Ems’ friend’s mum has popped round with some free PC games today, nice. She also very nearly got me a game review for PC Zone, that would have been great! Unfortunately the plug has been pulled on that mag so it wasn’t to be :0(. We’ve been on the park and beach today with Abby’s pal Shannon. We came back here and Ems had Tabby round to play while the oldies drank tea and chatted. Cousin Debs came for a light tea (meatballs and spaghetti washed down with choc pud and ice cream). Debs and Hels have popped down to the Crown for a few cheeky ones as it is (biddy) Liz Lawrence’s birthday – Happy Birthday Liz *should “H” and “B” be capital?? *.